International Students Workshop: Publication and Presentation of Scientific Research The following is a 12-minute talk given at an international conference. 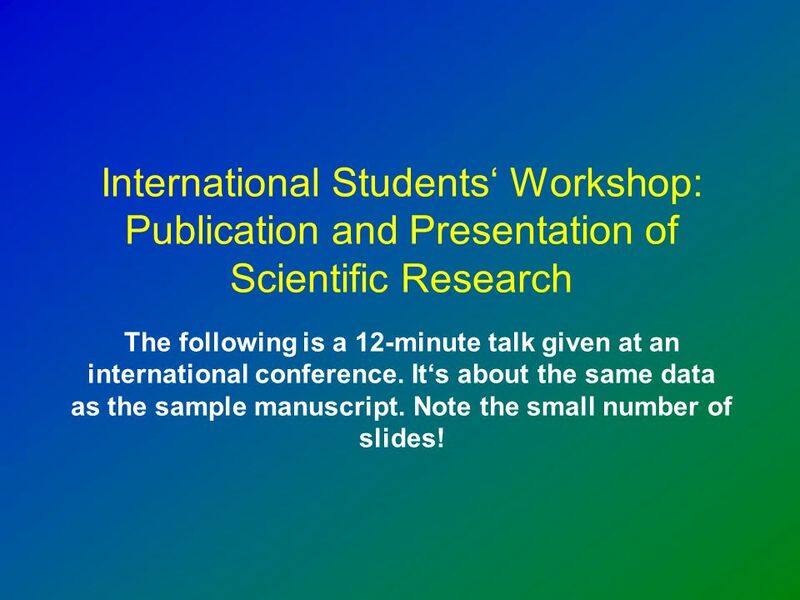 1 International Students Workshop: Publication and Presentation of Scientific Research The following is a 12-minute talk given at an international conference. Its about the same data as the sample manuscript. Note the small number of slides! 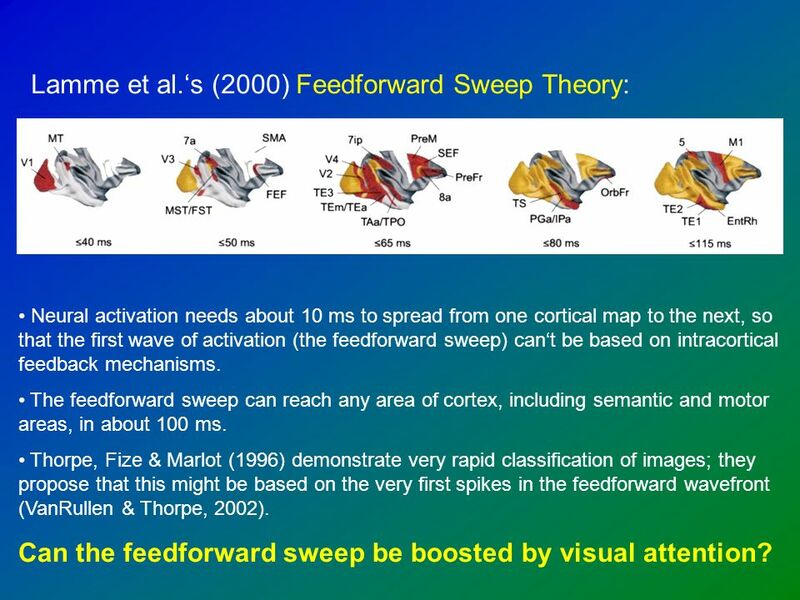 3 Lamme et al.s (2000) Feedforward Sweep Theory: Neural activation needs about 10 ms to spread from one cortical map to the next, so that the first wave of activation (the feedforward sweep) cant be based on intracortical feedback mechanisms. 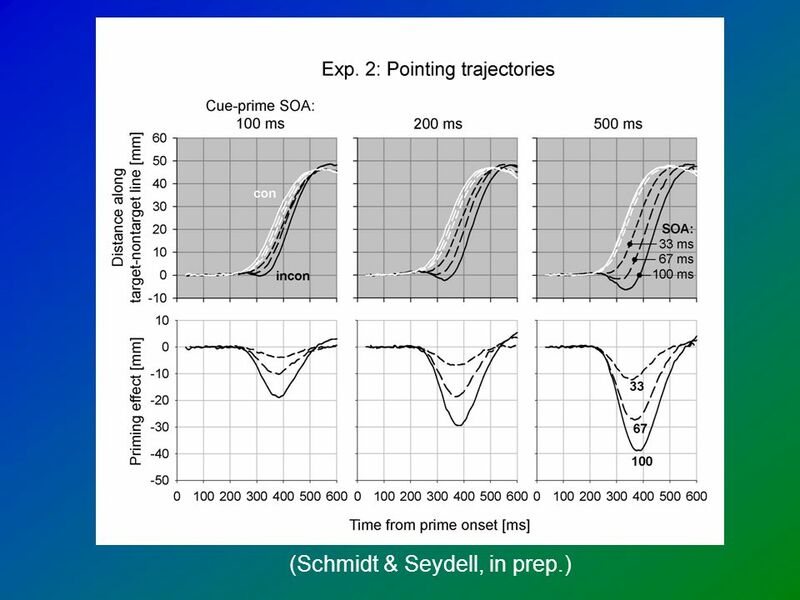 The feedforward sweep can reach any area of cortex, including semantic and motor areas, in about 100 ms. Thorpe, Fize & Marlot (1996) demonstrate very rapid classification of images; they propose that this might be based on the very first spikes in the feedforward wavefront (VanRullen & Thorpe, 2002). 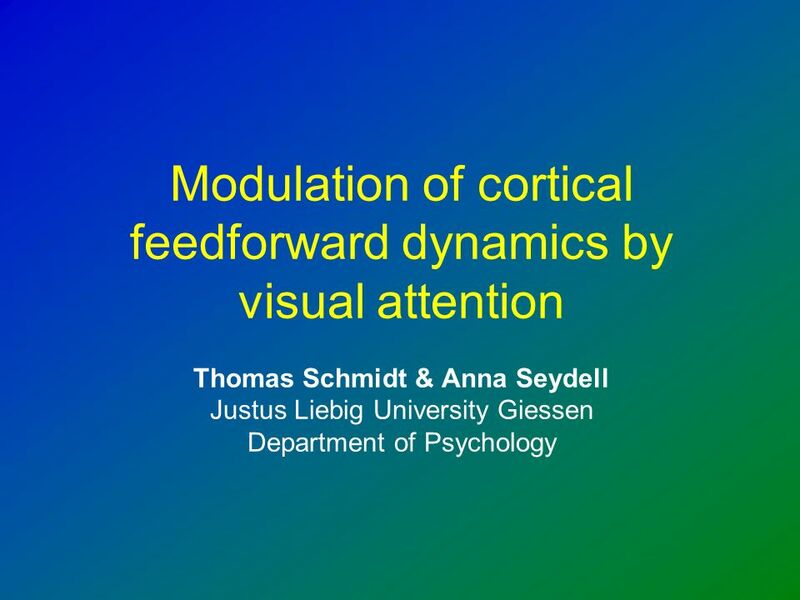 Can the feedforward sweep be boosted by visual attention? 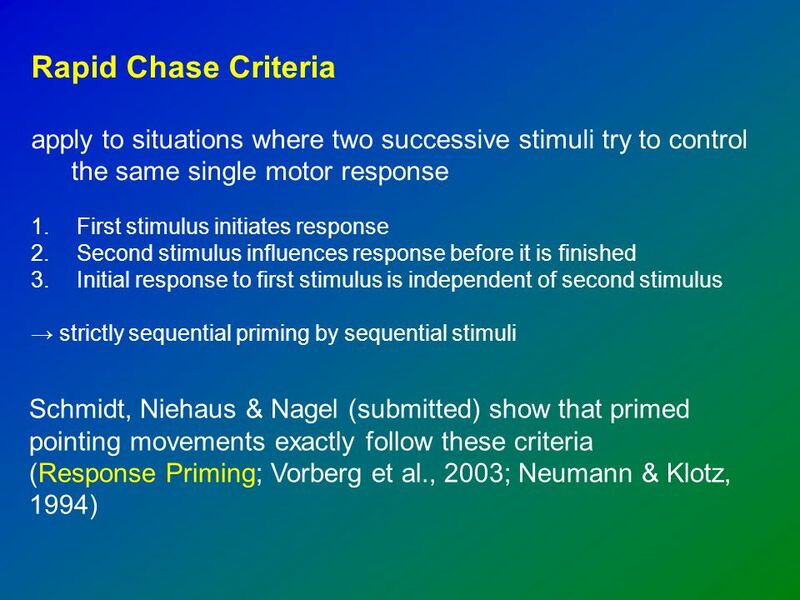 8 Discussion Visual attention (endogenous and exogenous) enhances response priming effects in pointing movements Time-course of priming meets two of the rapid chase criteria: 1. Primes initiate pointing response 2. 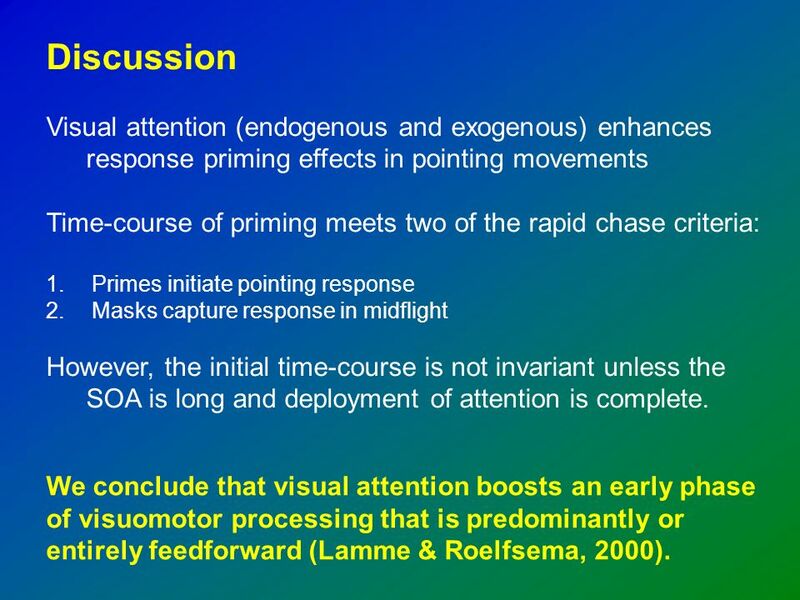 Masks capture response in midflight However, the initial time-course is not invariant unless the SOA is long and deployment of attention is complete. 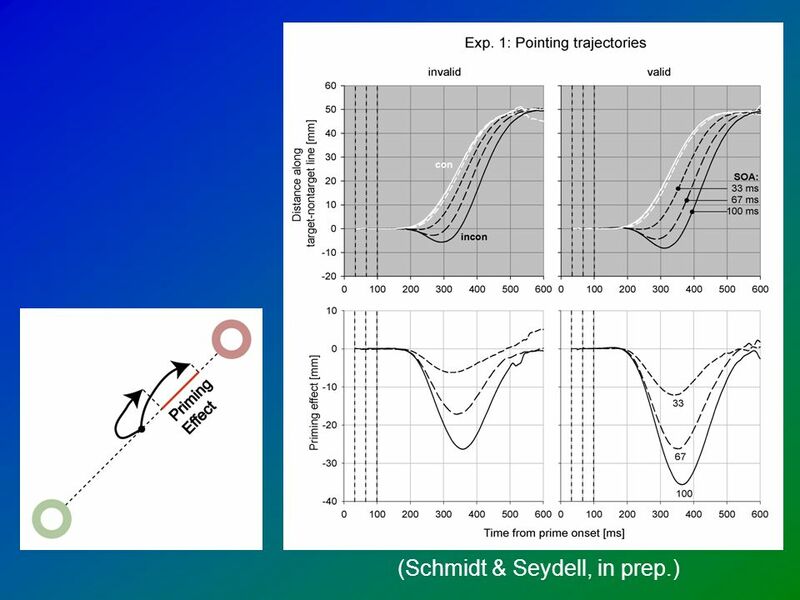 We conclude that visual attention boosts an early phase of visuomotor processing that is predominantly or entirely feedforward (Lamme & Roelfsema, 2000). 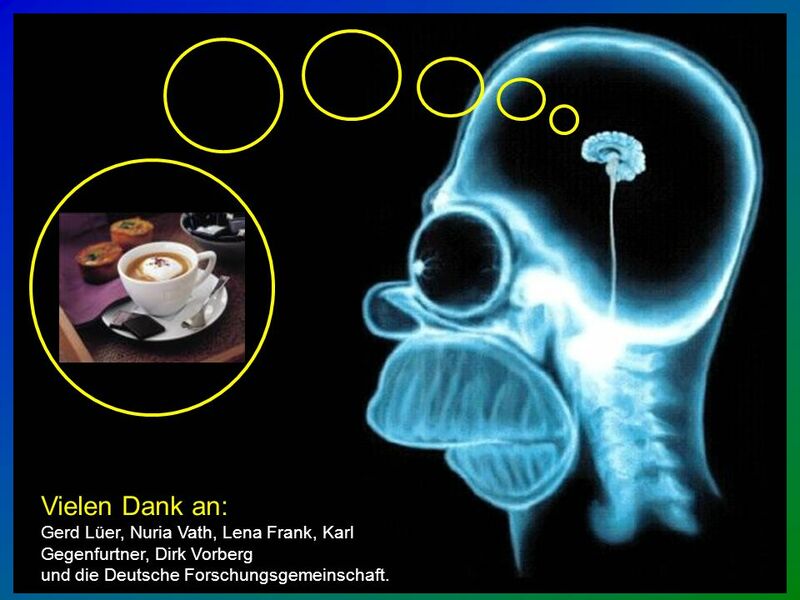 9 Vielen Dank an: Gerd Lüer, Nuria Vath, Lena Frank, Karl Gegenfurtner, Dirk Vorberg und die Deutsche Forschungsgemeinschaft. Download ppt "International Students Workshop: Publication and Presentation of Scientific Research The following is a 12-minute talk given at an international conference." Attributes of Attention: David Crundall Rm 315 Quantal or analogue? Spatial or object-based? "attention can be likened to a spotlight that enhances the. Delayed auditory feedback: a study into vocal motor patterns UCL Institute of Cognitive Neuroscience Dr Zarinah Agnew Dr Carolyn McGettigan Briony Banks. Modelling the classic Attentional Blink and its emotional variant Nikos Fragopanagos* & John Taylor** *Sponsored by the BBSRC **Sponsored by the BBSRC. What is the neural code? Puchalla et al., What is the neural code? Encoding: how does a stimulus cause the pattern of responses? what are the responses. Figure 17.1 Overview of descending motor control. Read this article for Friday next week Chelazzi L, Miller EK, Duncan J, Desimone R. A neural basis for visual search in inferior temporal cortex. Nature. Neighbour priming in eye movements during reading Kevin Paterson University of Leicester Samantha McCormick Royal Holloway, University of London Colin. Attentional Processes Gaia Scerif Room 426, Ext Office Hours: Thurs 11-1. Gina R. Kuperberg 1,2,3, Kana Okano 1, Don Goff 3,4, Kristina Fanucci 1,2,3, Marianna Eddy 1,5 1 Tufts University, 2 MGH/MIT/HMS Athinoula A. Martinos. Attention as a Controller Nienke J.H. Korsten, Nikos Fragopanagos, Matthew Hartley, Neill Taylor, and John G. Taylor Soft Computing Laboratory 김 희 택 Neural. 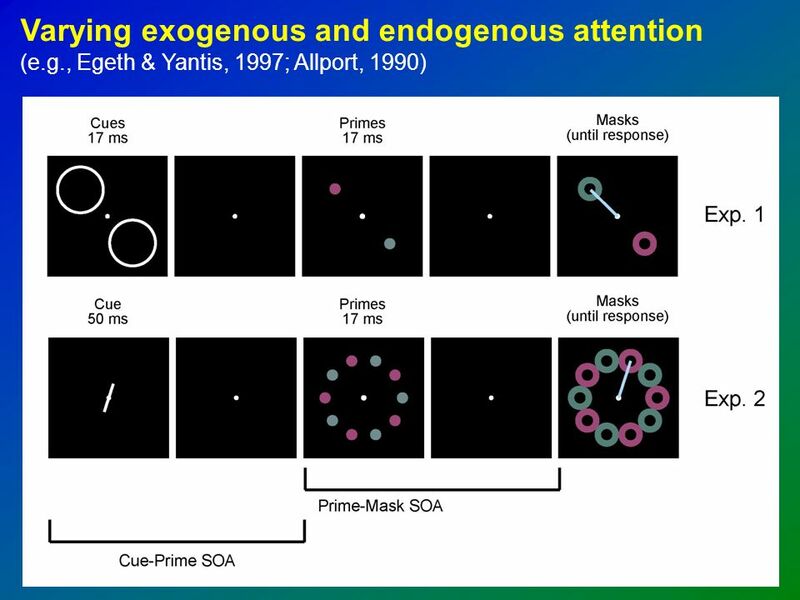 The Physiology of Attention. Physiology of Attention Neural systems involved in orienting Neural correlates of selection. Different Pathways, Different Processes. Retinocollicular vs. Retinostriate Recall that 10% of optic nerve gets routed through the Superior Colliculus. Neurodynamics of figure-ground organization Dražen Domijan University of Rijeka, Rijeka, Croatia 8th Alps-Adria Psychology Conference. Human (ERP and imaging) and monkey (cell recording) data together 1. Modality specific extrastriate cortex is modulated by attention (V4, IT, MT). 2. V1. Introduction definition of the construct a bit of history Spatial attention and early vision contrast spatial resolution some experimental methods Feature. Writing Workshop Here are some typical writing style issues which people have trouble with. Attention I Attention Wolfe et al Ch 7. Dana said that most vision is agenda-driven. He introduced the slide where the people attended to the many weird. Attention Wolfe et al Ch 7, Werner & Chalupa Ch 75, 78. Effect of laterality-specific training on visual learning Jenna Kelly & Nestor Matthews Department of Psychology, Denison University, Granville OH 43023.